Like many other good things, bananas are best enjoyed by dogs in moderation. They are full of beneficial vitamins and minerals that are good for dogs, but they are also sugary and aren’t meant to be a regular part of a dog’s diet. Here’s what you should know about safely feeding bananas to your dog. Bananas are a natural source of Vitamin B6 and Vitamin C. Vets sometimes recommend them as a treat because they are rich in potassium and low in sodium and cholesterol, making them a healthier choice than fatty or salty foods. They are also high in fiber, which is great for digestion and can remedy gastrointestinal problems. Bananas contain magnesium, too, which promotes bone growth and aids the body in absorption of protein and vitamins. Overall, it is a good choice for an occasional treat. 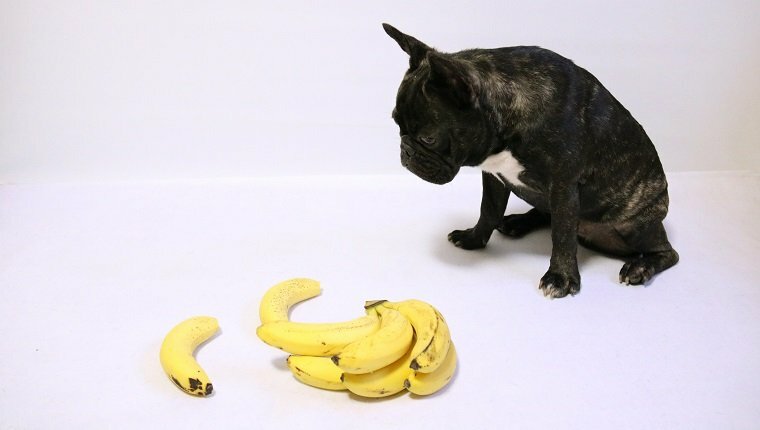 Like most fruits, bananas contain sugar, which can be problematic for dogs in high amounts and lead to gastrointestinal issues, obesity, and diabetes. Your dog would have to eat a large amount of these fruits fairly often to develop these conditions, but it is best to make sure your dog doesn’t go overboard. Additionally, the high fiber content can lead to constipation if dogs have too many in one sitting, and some dogs just have difficulty digesting bananas. Obviously, you should NOT feed your dog the peel of the banana. The peels aren’t toxic, but they are hard to digest. As with almost any food, there is a risk that your dog will be allergic. 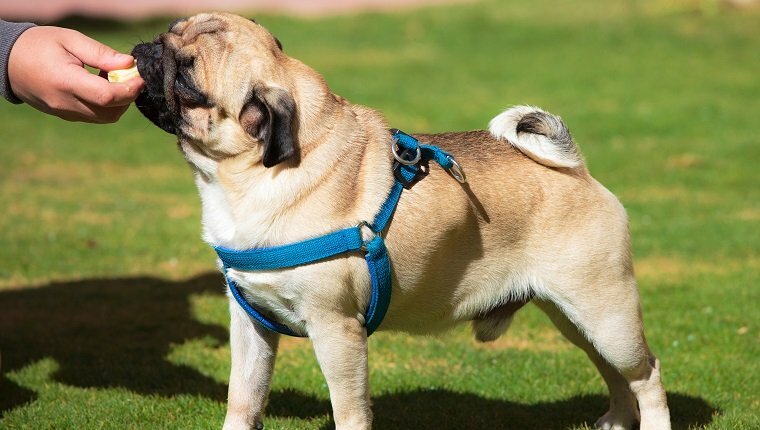 If you see the signs of an allergic reaction, including swelling, hives, difficulty breathing, sneezing, coughing, or other symptoms, you should stop feeding your dog bananas and contact your veterinarian right away. 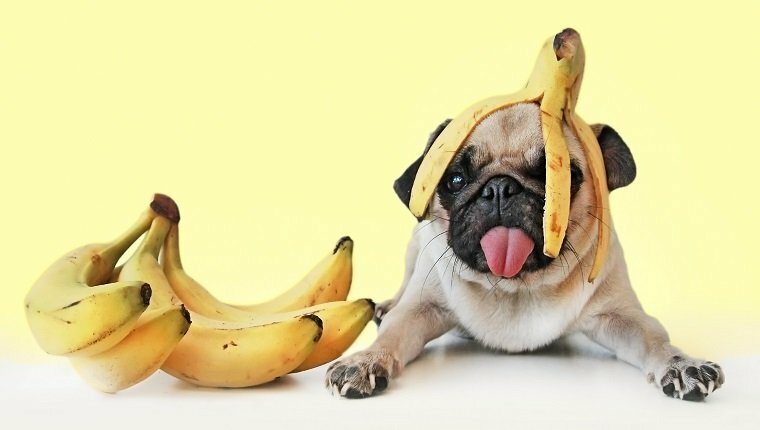 How Should You Feed Bananas To Your Dog? Before you feed your dog any bananas, consult your veterinarian. They can tell you the right amountfor your specific dog based on their dietary needs and weight. 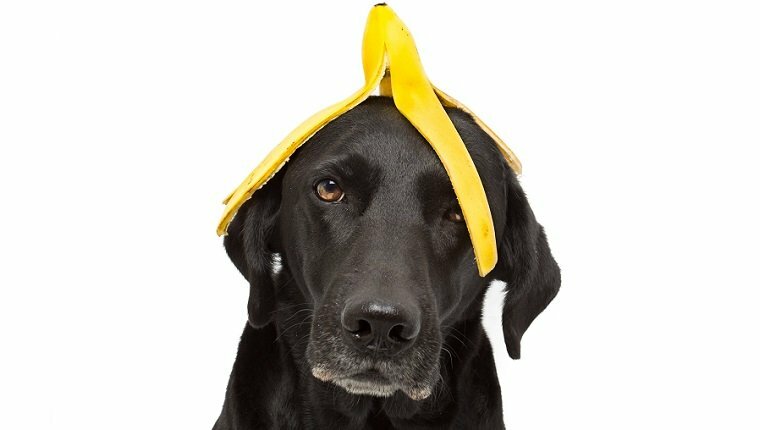 If your veterinarian gives you the okay, there are several ways you can feed bananas to your dog. Freeze them, peel them, cut them up, and give your dog a refreshing, frozen treat. These are especially nice on a hot summer day, and they’re super easy to prepare. Mash them up and stir them into your dog’s food. Your dog might love the sweet flavor and enjoy a change of pace from their regular meal. Smush them and stuff them in a toy, Kong, or puzzle feeder. This will give your dog some mental and physical stimulation and help reduce boredom. Mix them in a treat recipe. You can find plenty of recipes for banana dog treats by searching online. Some favorite things to mix bananas with include peanut butter (make sure it doesn’t have xylitol) or yogurt, but you should also ask your vet before feeding your dog these foods. Do you feed your dog bananas? Do you have any favorite banana dog treat recipes? Let us know in the comments below!